Thanks to Dr. Matthew Stark, Tulane University, Louisiana (USA), for contributing this case and much of the discussion. To contribute a Case of the Week, follow the guidelines on our Case of the Week page. (1) Support The Detroit College Promise, the charity sponsored by PathologyOutlines.com, at the Big House, Big Heart run / walk on October 3, 2010 in Ann Arbor, Michigan. Participants can walk, run or wheel in a 10K, 5K, or 1 mile race. 100% of dollars raised by the Detroit College Promise team will be used to provide scholarships to graduating Detroit Public School students to attend Michigan public colleges and universities. Click here for more information. (2) We posted a new article on our Management Page - Changing Billing Services, by Mick Raich, Vachette Pathology, click here. This page is accessible from the Home Page under Clinical Pathology Chapters. (3) For all pathologist / PhD jobs posted between September 13 and December 31, 2010, we are adding a new offer: you can purchase a Laboratory job ad or a Dermatology job ad (on DermatologyOutlines.com) for 50% off the usual price. The discounted ad must be placed by March 31, 2011. 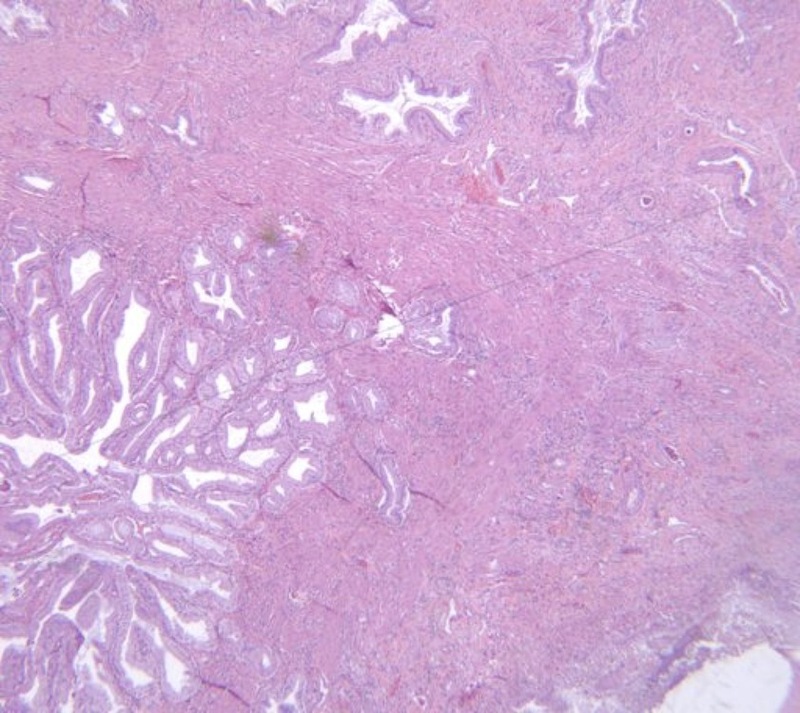 A 60 year old women with a history of coronary artery disease, chronic pancreatitis and cholelithiasis presented with abdominal pain. An exploratory laparotomy was performed to rule out a perforated viscous. 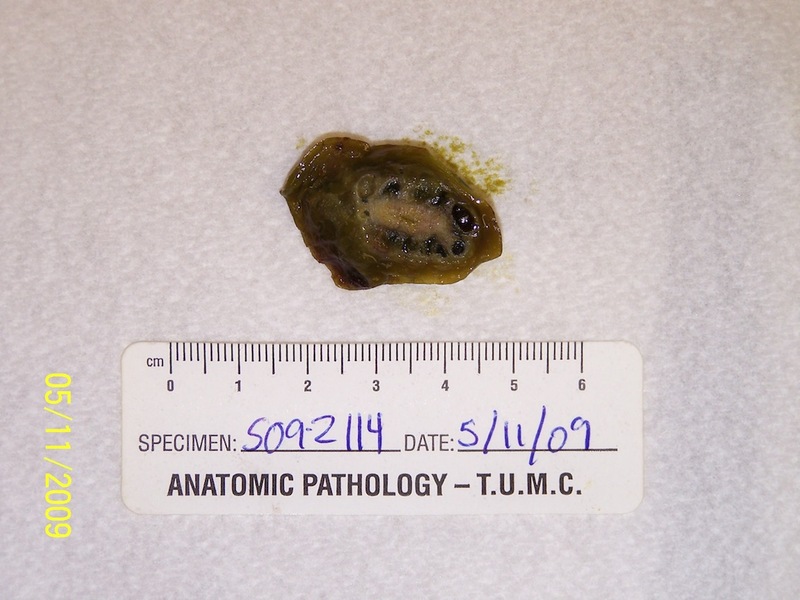 A gangrenous gallbladder was removed and sent to pathology. 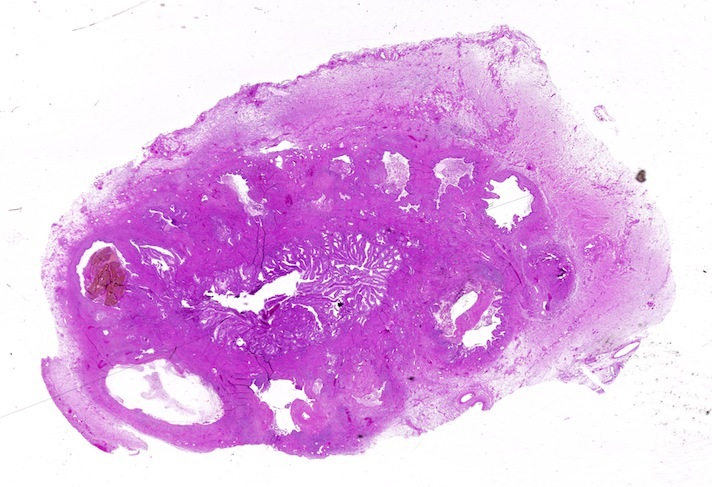 Gallbladder adenomyoma is a hyperplastic proliferation of benign glands, without potential for malignant transformation. This is an acquired condition that appears to increase with age. One large post-mortem study found a prevalence of 1% (Shepard VD, Walters W, Dockerty MB: Benign neoplasms of the gallbladder. Arch Surg 1942;45:1.) while radiologic diagnostic prevalence is around 5% (Br J Radiol 1961;34:101). This is a well characterized lesion, typically in the fundus, with greater than fifteen different names noted in the pathologic and radiologic literature. 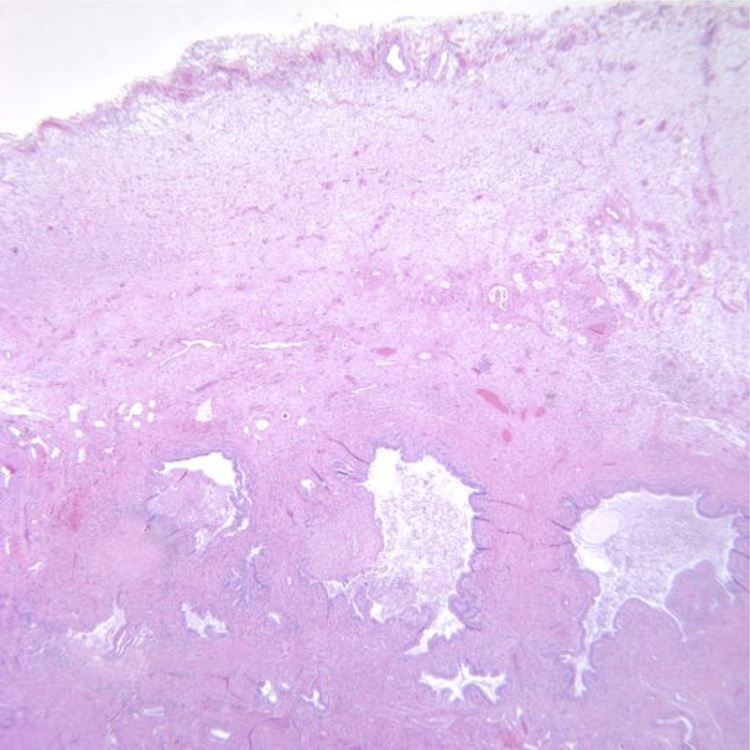 Microscopically, the glands extrude through areas of focal muscular weakness of the gallbaldder wall where the penetrating arteries come through. 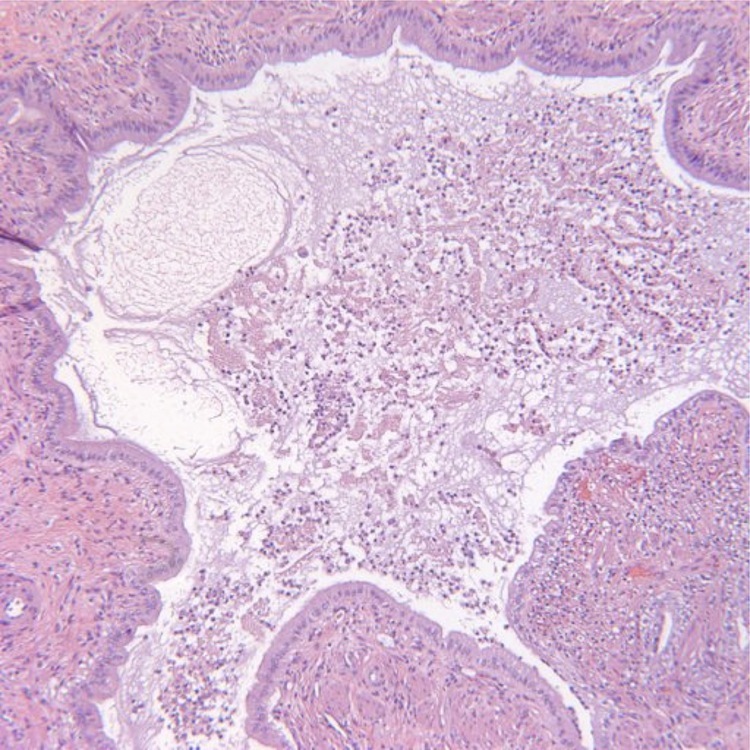 The hyperplastic glands push the lamina propria, which in the normal gallbladder lies directly on the muscular layer, through the muscular wall. The muscular wall thickens, sometimes to five times its normal size, giving the definitional appearance of the lesion. 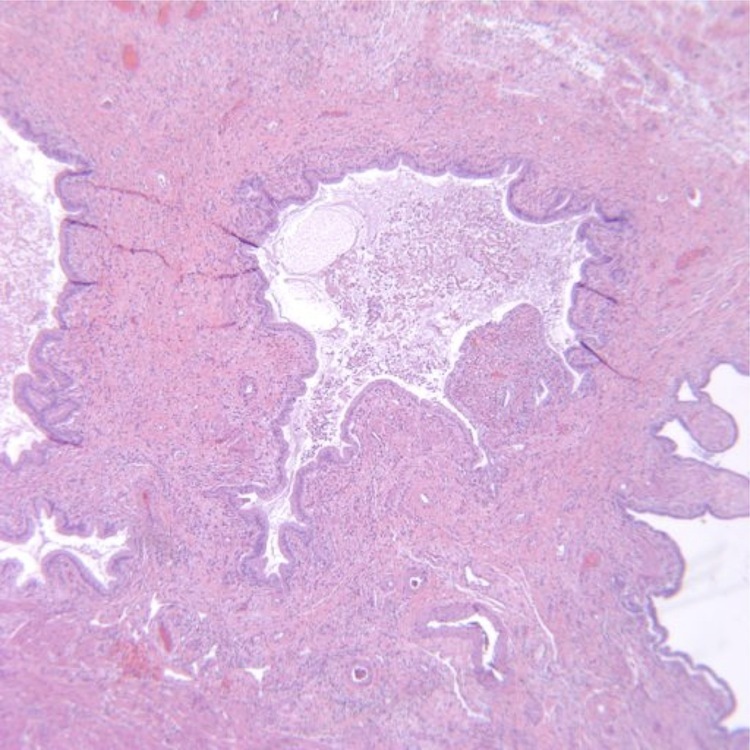 Inflammation is sometimes seen, but adenomyoma is neither caused by, nor does it normally cause inflamation. 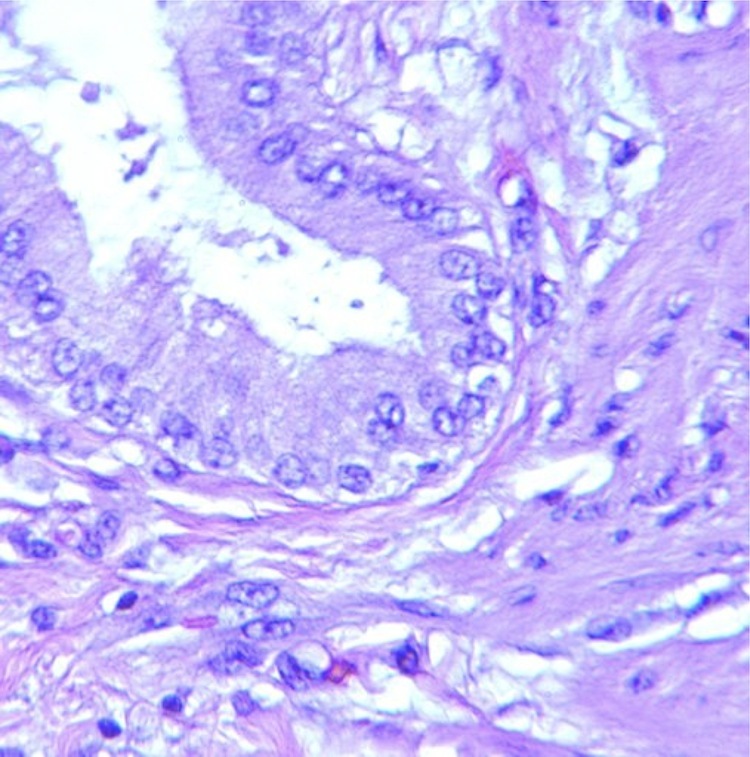 The term "adenomyoma" is reserved for protruding solitary lesions in the fundus; generalized outpouchings throughout the gallbladder are called adenomyomatosis (Radiographics 2006;26:941). 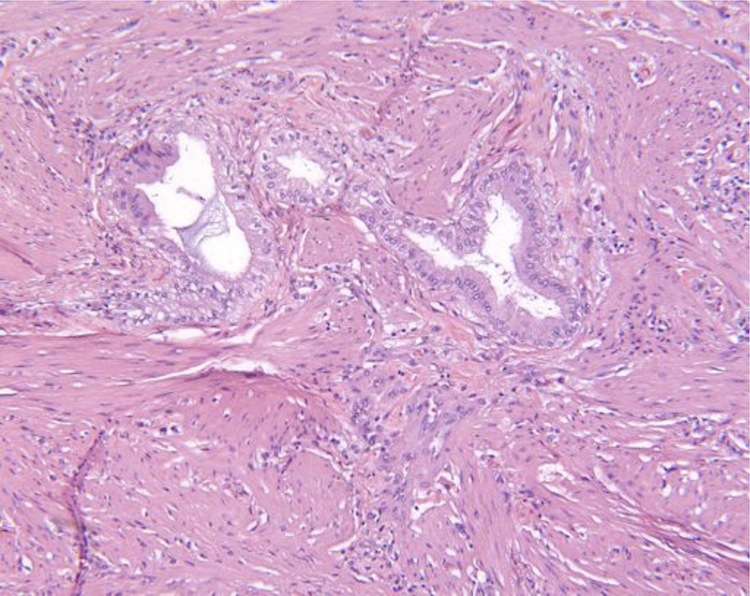 The lesion is not specifically associated with cholelithasis, nor does it appear to be a precursor of carcinoma. 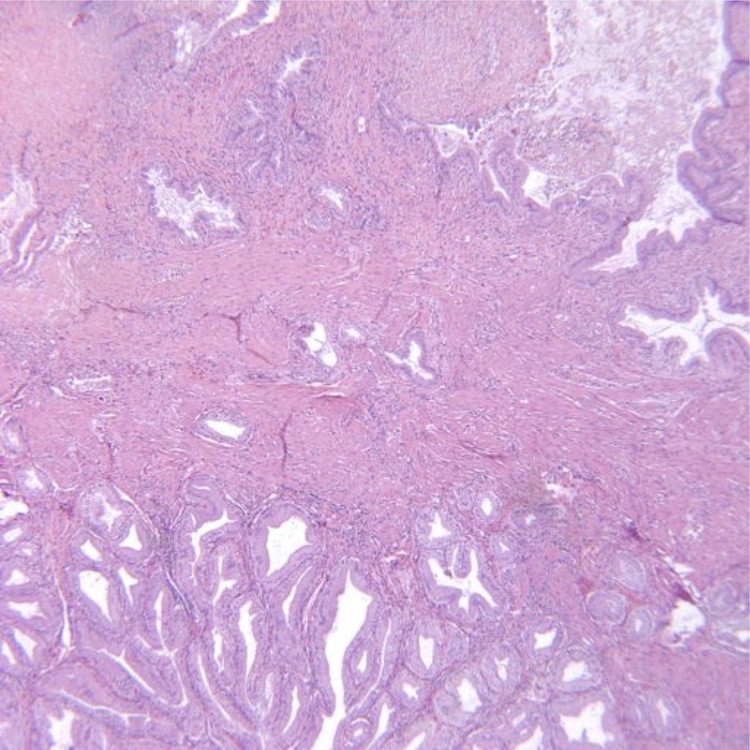 There is an association with anomalous pancreaticobiliary ductal union and adenomyomatosis (J Gastroenterol Hepatol 1998; 13:175).